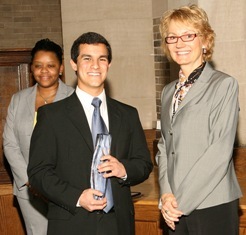 Oscar Gamarra, a senior finance major, was named Athletic Deans' Award winner at the university’s 13th annual Athletics Academic Recognition luncheon at St. Andrew’s on April 18. The award is given to each student athlete with the highest GPA in their college. A four-year member of the university’s tennis team, Gamarra has a 3.91 cumulative GPA. Gamarra said it felt good to be recognized for his academic achievements. “The [academic] awards are more beneficial to me in the future when applying for jobs,” Gamarra said. “Oscar is one of the most organized student athletes that I have ever had. The rigors of being an athlete and the demands on student athletes are very high and he is amazingly good at staying on task and making sure he stays on top of everything,” said Bryan Morrow, men’s tennis coach at WSU. Morrow has coached Gamarra for four years. Gamarra said students have to be willing to scarify a lot of free time. “I always had a schedule for everything I wanted to do every day, even in my free time, and gave myself deadlines,” Gamarra said. Athletically, he finished his career tied for eighth in doubles wins and 10th in singles victories.